Only nine more days before I leave for home. Today, I headed to Parsons Lodge, a very pleasant stone and lodgepole pine structure built by the Sierra Club in 1915 near Soda Springs. However, the number of visitors is usually small compared to the other volunteer stations, so the day sometimes drags there. Today was quite different. With almost 200 visitors, I found myself answering questions almost all day long. Visitors included a family from Charlotte, NC. It’s always good to see people who remind me of home. I encountered my first visitors from Israel and South Africa. They were a pleasant treat. The highlight of the day came with a family that included a very young Junior Ranger. He was excited about almost everything, including a toad that had managed to hop on a window shutter and a marmot on a nearby stack of rocks. But the young Ranger’s really big moment came when a Ranger (Fred) rode up the trail on his horse King. The child was truly star struck as Ranger Fred took 10 minutes to engage the young Ranger. I’m sure the child will enjoy the memory for quite some time. After closing up shop, I returned to the campground where four of us decided to head to the Lee Vining Mobil for dinner. As we shared our fare, we all commented on how rapidly our service is coming to a close. While we will miss each other, I think all of us are ready to return to our homes. Another day in Tuolumne. The temperatures are dropping, with highs in the 60’s today and lows in the 30’s expected tonight. It’s now time to bundle up, slip into the sleeping bag, and hope to ward off the chill. The time here has been wonderful, but I look forward to returning to the comforts of home. Yesterday, after completing the 15-mile Clouds Rest hike, I thought I had the biggest news of the day. Not so. Susan, a volunteer who has hiked most of Yosemite’s trails, wanted a new challenge. She got one. She had driven down Tioga Road to 395 South and then on a 4-mile rough road to hike the June Lake North Loop. Eager to begin her new adventure, she hit the car lock button on the driver’s side door, hopped out, and shut the door. As the door left her finger tips, she suddenly realized she had left her car keys (along with all the important personal possessions she had brought to Yosemite) INSIDE THE CAR. Her new-found adventure proved to be trying to restore the status quo rather than striking out on a new trail. Susan walked 15 minutes up the trail and met two women, a mother and her daughter, coming off the trail. The women kindly offered to take Susan to the June Lakes Shell station. When Susan got there, she was told the Lee Vining Shell would have to help. That station offers AAA towing service. When the tow truck arrived, the employee drove Susan to her car. The employee made a valiant effort, but he was unable to open the car. Susan would have to contact Lexus for information on how to access her car. Meanwhile, the employee kindly took Susan to the Lee Vining Mobil, where she expected volunteers to come for dinner. She could catch a ride with them, she said. They always had dinner there every Sunday night. Well, almost every Sunday night. Not this Sunday night. She then tried phoning two of the volunteers. Good luck with that. 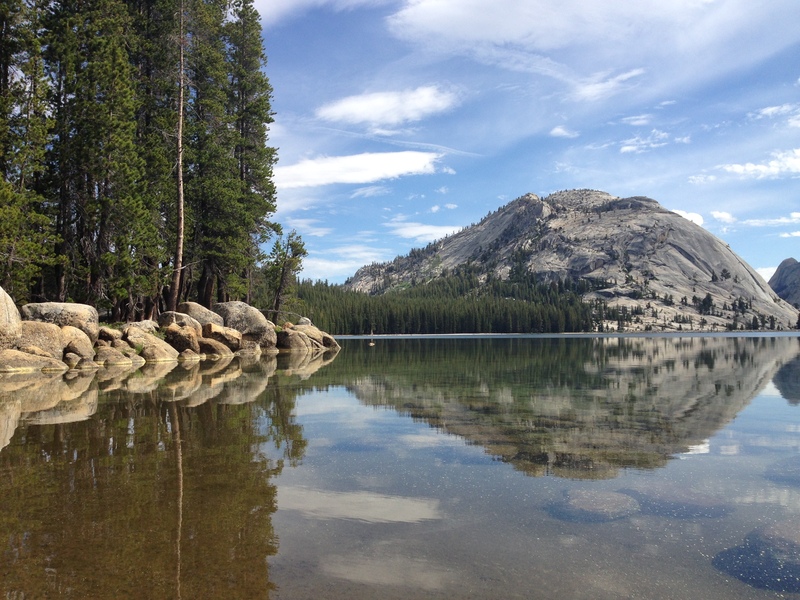 Cell phone service in Tuolumne Meadows is spotty at best. Time to put out the hitchhiker’s thumb. Humbled by multiple drivers avoiding eye contact with her, Susan finally caught a ride with the fifth prospect. About 6:30, she dejectedly hobbled into camp with her story. Her fellow campers’ suggestions focused primarily on breaking one of the windows to gain access. Ultimately, everyone agreed she should try to reach Lexus for assistance. All of us thought she might have to have the car towed to Bishop, CA, or Reno, NV. After numerous efforts to reach Lexus, she finally reached a representative who told her she might be able to open the car trunk by pushing a button on the rear bumper. If that did not work, the Reno Lexus dealership, 120 miles away, would have to retrieve the car. With our fingers crossed, I drove Susan and Woodlee to the Lee Vining Mobil. 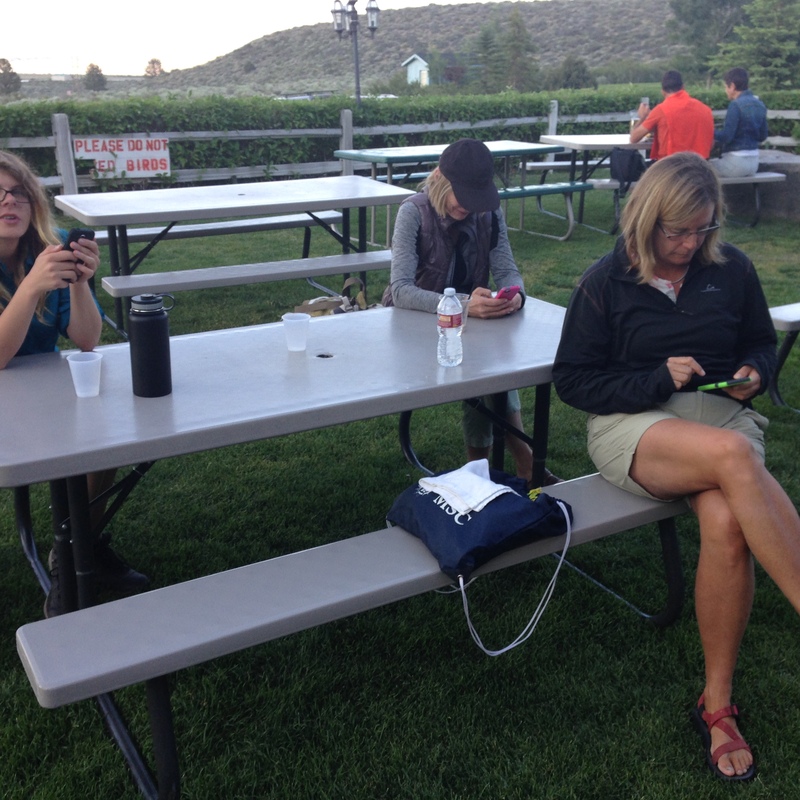 There, we checked e-mails and cell phone messages before heading to the June Lakes trailhead. Down 395 we went until Susan directed me to the side road leading to the trailhead. I maintained a speed of about 8 mph over the rough road. I did not dare drive any faster. After about 25 minutes, we finally reached Susan’s car. She approached the rear bumper with a hope and a prayer and VOILA!, the trunk opened. She now had access to all that the day before meant so little to her but now restored her to ready access to the modern world – car keys, credit cards, cash, and prescription medicine. From there, we hurried back (well, after getting off the 8mph road) to Lee Vining for a celebratory lunch. All was well. The remainder of the day was pretty uneventful. But restoring Susan’s peace of mind, and her car with the worldly possessions all of us have come to rely on, made for a great day. It’s the type of event that builds cohesion in this talented group of volunteers. The onslaught began long before this weekend, but Independence Day Weekend saw the dam burst. It began quietly enough. On Friday, July 3, I handled Olmsted Point. The highlights were seeing a couple from Charlotte and a UVA family (parents are UVA alumni and the children have either graduated from UVA or currently attend). Every available parking space along Tioga Road between Olmsted Point and the Visitor Center (about 8 miles) looked occupied by 2:00. Driving down the road, one has to be prepared for a driver overwhelmed by a photo op – car doors fly open, the driver or passenger oblivious to oncoming traffic in hot pursuit of the perfect picture. Beautiful lakes and granite domes have a way of throwing the human thought process completely out of kilter. After my shift I headed to the Tuolumne Grill with visions of a soft ice cream swirl cone dancing in my head. It was not to be. The order line extended fifteen people outside the entrance. I had laundry to do, so I opted for an ice cream bar from the general store. After polishing off “lunch,” I gathered my laundry and headed for the washers and dryers on Bug Camp Road. Both washers were available, much to my delight. It’s the small things that bring joy when you are away from the conveniences of home. While the washing machines filled and grunted in response to the 10-day loads, I called the home front to catch up on the most recent news. That lasted a full wash cycle and half of the drying time. Soon I was back to the campground with a load of clean “outdoor scent” clothes. My laundry detergent had to stick with this summer’s overall theme. I attended a ranger talk and performance after my ten-minute meal of ham, crackers, fruit, and cookies. The ranger is an accomplished flutist, having performed with the Santa Monica Symphony. Her love for the park and the planet shone through as members of the audience read quotes from American astronauts and Soviet cosmonauts about the tremendous personal impact they experienced while viewing Earth from space. Ours is a fragile planet, with no evidence of a similar life-sustaining planet nearby. The quotes and the music should make any listener give greater thought to our good fortune and our obligation to preserve a healthy planet for the generations that follow us. Now it’s off to bed with three free days ahead of me. I plan to hike Clouds Rest on Sunday. I hope my 63 year old bones and muscles are up to the challenge. Happy Independence Day. Well, not quite three days off. I filled in for another volunteer whose friend had come to visit. Once again, I headed to Olmsted Point. During my previous work days at Olmsted, several visitors unsuccessfully tried taking a photograph through the telescope. Today, one young man succeeded in doing so. I seized the moment and the young man did the same for my iPhone as well as for several other visitors. It was nice to be on the receiving end of a kind gesture. Rain was in the forecast, but was limited to threatening storm clouds and a few minutes of drizzle. The real storm came in Yosemite Valley where traffic became so overwhelming that the Rangers had to turn away any visitors who did not have lodging reservations. Like the day before, traffic was heavy on Tioga Road. The scene at Tenaya Lake looked like Myrtle Beach during high season. I hope the tourists treated the shoreline gently, taking away their sandwich wrappers and empty soda cans. At the Visitors Center, tourists were overwhelming the Rangers. Whenever a tourist asks how to see all of the Park’s world-famous features in the next three hours, I try to remember my first visit when I could not believe a 45-mile drive can take 90 minutes. These are mountain roads, and on a holiday weekend, very crowded mountains roads. There are no interstates with 65 miles per hour speed limits. The potluck dinner included chips and dips, a quiche, pasta, salads, and dessert. Conversation was warm and laughter constant. The meal was followed by several friendly games. Our group has learned and accepted one another’s idiosyncrasies, and we all appreciate the talents each of us brings to the team. It was a wonderful, warm gathering, enhanced by the charm of two volunteers’ guests. One is a young French engineering student who is working in the United States for six months as part of his collegiate requirements. The other is a sweet young woman who is the lifelong friend of one of the volunteers. It’s time to get to bed so I can rise early for a 15-mile hike to Clouds Rest. I’ll report on that experience tomorrow. Occasionally it’s good to test your physical limits. Today I tested mine. The longest hike I had taken so far was the Mono Pass trail, a little less than eight miles. Clouds Rest, counting the distance to the trail head, is about 15 miles. On the recommendation of my colleagues, I left the hiking boots behind and used my sneakers instead, thus giving my heels a fighting chance. 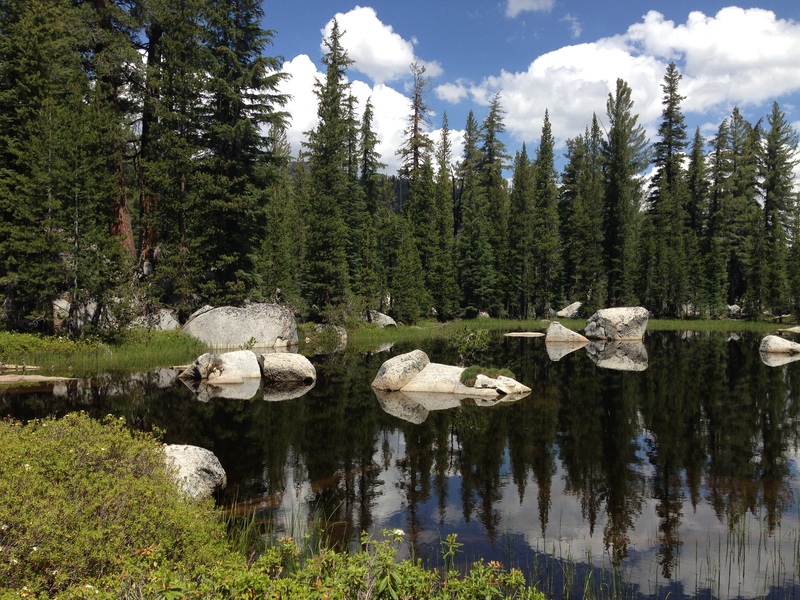 For those unacquainted with hiking in the Sierra Nevada, you should not equate hiking trail distances with walking through your neighborhood or time spent on the treadmill. Grades vary and the hiker is constantly avoiding rocks and roots on the trail or sometimes using them like stair steps. I had hiked Clouds Rest twice before, most recently 10 years ago. I remembered much of the terrain but had forgotten that about 1 1/2 miles of the early section of the trail are all switchbacks and much of that section is little more than a rock-strewn gully. Average hiking time on mountain trails is 2 miles per hour. On this section of the trail, the time extends to one mile per hour. And while Clouds Rest is 1700 feet above the elevation of the trailhead, there is a lot of up and down, making the hike seem more like a 2500 foot elevation gain. Those are the challenges. Now for the positives. 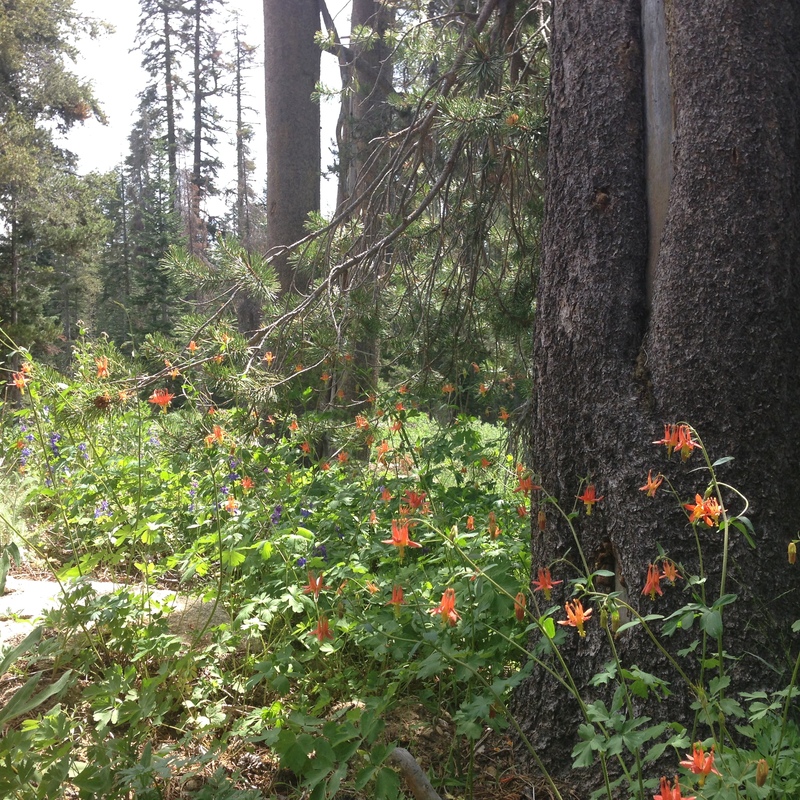 Today proved prime time for Yosemite’s wildflowers. 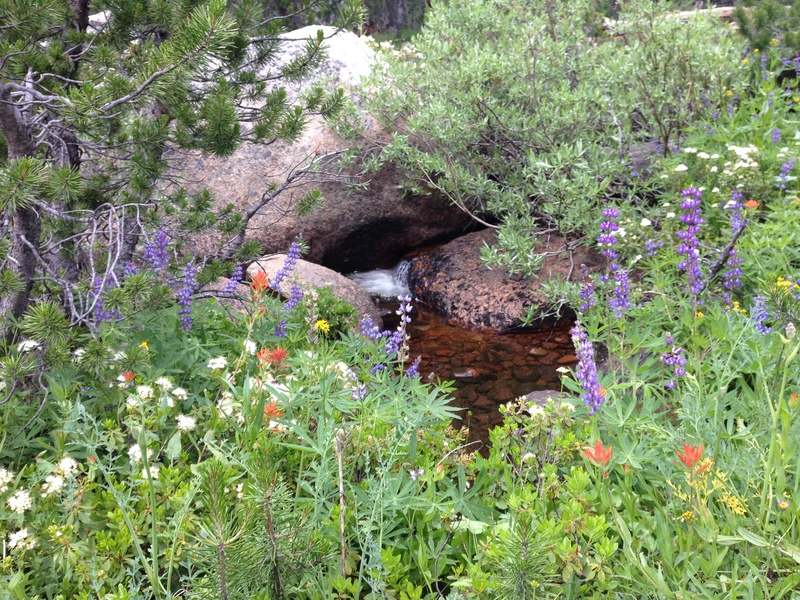 Indian paintbrush, showy lupine, and California corn lily – just to mention a few – were in full bloom. 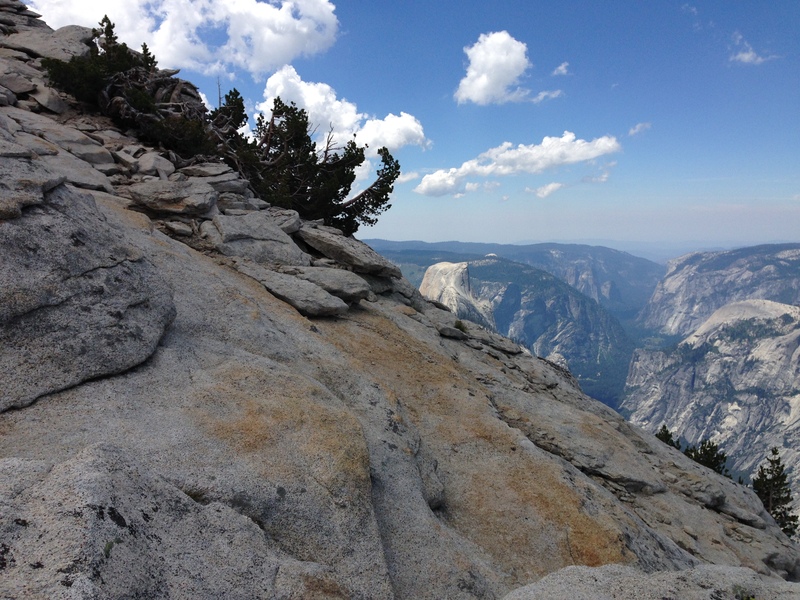 And the views once I climbed Clouds Rest? In one direction Yosemite Valley lay out before me. In other directions, I could see all the major features of the High Sierra. Tenaya Lake, where I began my hike, looked like a tiny blue speck in the distance (And, of course, I had to return to that tiny blue speck over seven miles away to conclude my hike.). That 1 1/2 mile section of trail alluded to earlier proved extremely challenging to my cartilage depleted knees, particularly the part where my size 13 feet had to handle treads meant for size sixes. Nevertheless, I finished the hike around 4:30 in the afternoon and planned to reward my achievement with fine dining at the Mobil after a hot shower. But time ran late and no one else wanted to go, so I satisfied myself with deli food. Tonight, every muscle and bone in my body aches. Those aches will disappear in a few days and I will be able to count another challenging but wonderful Yosemite memory. Only two weeks remain before I leave the park. Back to Olmsted Point today. I never know whether I’ll freeze or fry. This morning, brisk breezes brought a chill to the air so I found myself wearing my parka the entire shift. 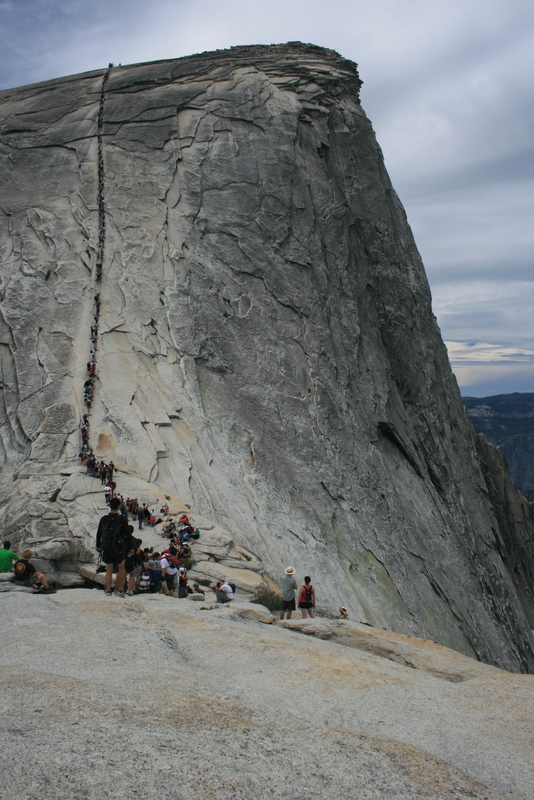 Hikers on the Half Dome cables came in greater numbers than normal. A large group must have camped in Little Yosemite Valley the previous night to get a three-hour head start on hikers starting from Happy Isles in [Big] Yosemite Valley. It was fortuitous because dark clouds threatened early. It’s not wise to cling on to steel cables for dear life if an electrical storm threatens. I got the usual “oh” or laughter whenever a visitor using the telescope honed in on the hikers climbing the cables. I’ve learned that foreign visitors not fluent in English are reluctant to approach the telescope. I’ve spoken with many visitors from Belgium. [Are there any remaining at home to tend to the chocolate shops?] They largely speak our language very well and are very courteous. Today, I spoke with five Belgians who were very interested in the local sights, but also took great interest in me – we spoke for about 15 minutes and they seemed reluctant to leave. I finally moved on to other visitors, but the Belgians left me with good feelings about their country. We Americans would do well to emulate their conduct. We had an afternoon shower around 3pm and an evening thunderstorm just after 9pm. 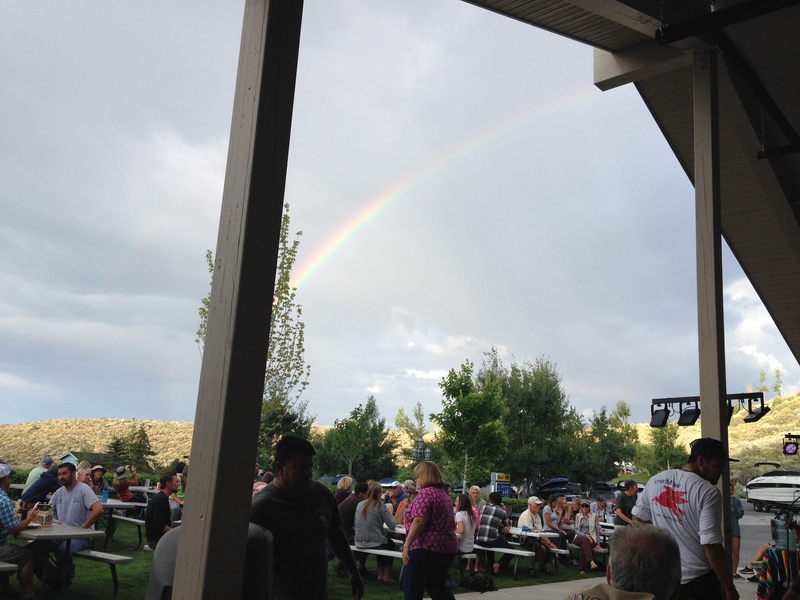 I’m glad the evening storm held off until I returned to my tent from a Ranger campfire program about global warming and its direct effects on the Sierra Nevada. Once again, my REI Kingdom 4 has weathered the storms. This being my last day off before returning to my volunteer stations, I wanted to get in a decent hike. Several years ago, I had tried this hike but found my navigational skills were not up to the challenge. I inferred from several conversations that a fellow volunteer, Cyndi, knew the trail. We arrived at the trailhead (across Tioga Road from Murphy Creek parking and picnic tables) around 9:30 a.m. It turns out Cyndi had not hiked the trail previously so the question was whether two heads are better than one. Despite the warning, we proceeded with our 5-6 mile hike. Much of the trail was obvious, but midway through we saw no evidence of cairns (stacks of rocks used as trail markers). After fumbling around for a half hour or so, we finally found a few cairns and soon thereafter stopped at several beautiful but buggy lakes. 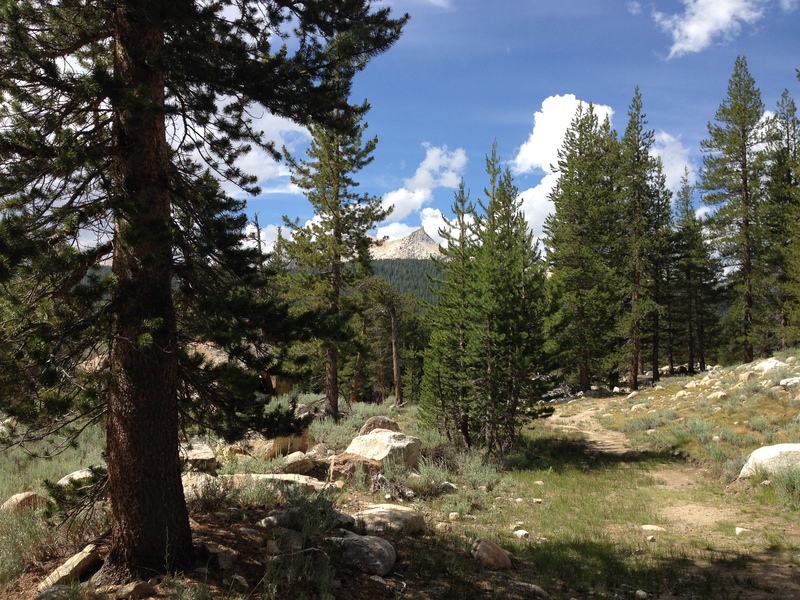 After taking a dozen photos or so, we headed back to Tioga Road. We had better luck on the return trip, carefully watching for cairns until we reached the well-established first half of the trail. Not satisfied with the exercise provided by the hike, Cyndi decided to swim across and back Tenaya Lake (from the Murphy Creek picnic area), a total distance of one mile. I was content to finish my lunch. Afterwards I spoke with several Canadian visitors who were traveling the United States without any set time schedule. They already had seen many U.S. national parks and were on their way to seeing more. All Americans should be so lucky. Late afternoon found Tuolumne Meadows hit with a heavy thunderstorm. Once more, my REI Kingdom 4 met the challenge, making me a happy camper. Not wishing to remain in our now very wet campground, four of us accepted our youngest volunteer’s (Cassie) invitation to ride with her to Lee Vining for dinner at the Mobil. I had already eaten, but looked forward to their company. We discussed a variety of topics. 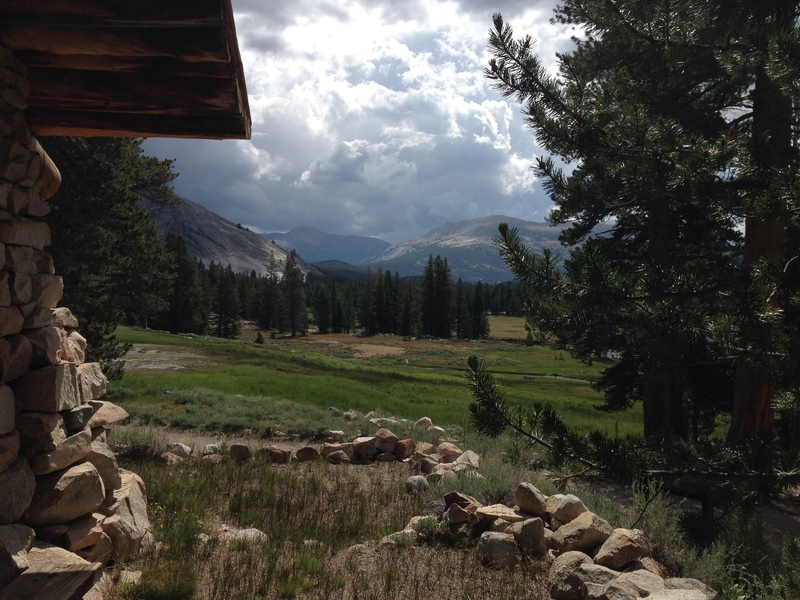 I mentioned my recent exploratory visit to Tioga Pass Resort (TPR). Our team leader, Woodlee, had mentioned his upcoming birthday and his wish for a pie from the resort, which has an on-site baker. Upon my inquiry to the cashier, she said the pie sells for $7.25 per slice. She had to check with the baker about the price of a whole pie. After making the inquiry, she informed me that each pie is cut into eight slices. TPR would give a one-slice discount, selling an entire pie for a bargain price of $50.75 plus tax, for a total of over $56.00! It looks like Woodlee will be disappointed. Our return trip to our campground allowed a glimpse of a full moon, lighting up much of our surroundings. We remained quietly respectful of the magnificent scene, mountains and meadows bathed in the moonlight, leading us back to our summer home. This was the first of three days off (in a 3 days on, 3 days off schedule). I headed to Glacier Point after dropping off a fellow volunteer at Olmsted Point. Storm clouds dominated the sky, with showers in the forecast. Early morning temperatures hit 50 degrees, unseasonably mild. After a two-hour drive, I hit Glacier Point Road around 11am. I stopped at a meadow blanketed with wildflowers and took lots of pictures. 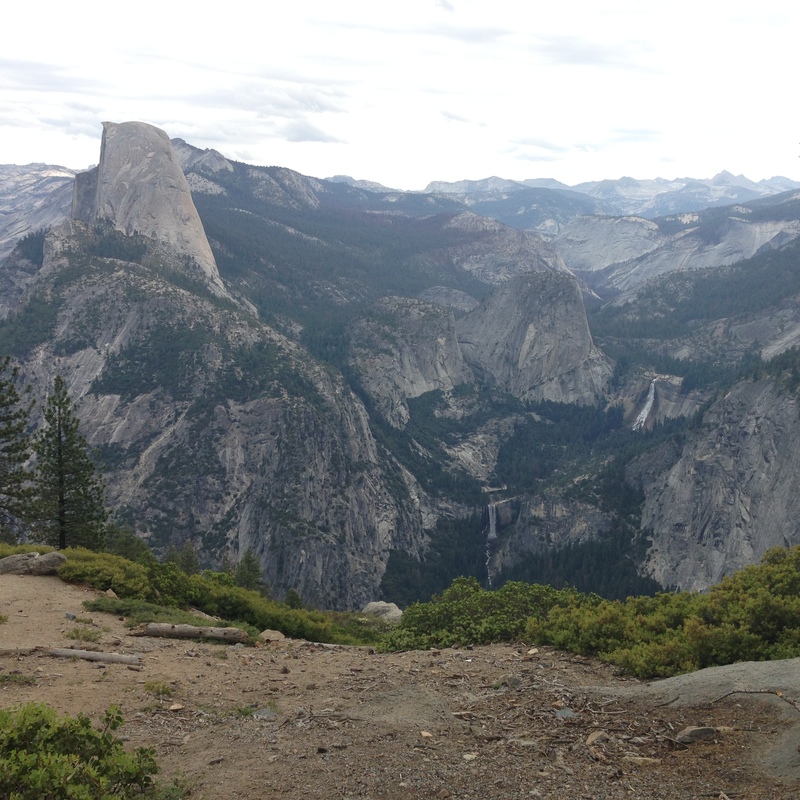 I proceeded to Washburn Point, which overlooks Half Dome, Vernal Fall, and Nevada Fall. Both falls are flowing at probably half the normal flow rate for this time of year, which means hikers on the Mist Trail will actually walk through a genuine mist rather than heavy showers. The clouds grew darker as I took more photos. I drove to Glacier Point. Rush hour at noon. I had no luck finding a parking spot. After leaving the parking lot I parked at a pullover to get a Half Dome “road hazard” shot – the granite monolith fills the windshield past a road that drops off into oblivion. Having no luck at Glacier Point, I drove west down Glacier Point Road to the Sentinel Dome trail. I took more wildflower photos as well as shots of Yosemite Falls – fast drying up, but an afternoon shower delays that unhappy event. The rain became heavy ten minutes before I reached my car, but I had dressed for it – a light parka and nylon shorts. Time to make the 2+ hour drive to Tuolumne Meadows. I reached the Dog Lake parking lot at 3:45. It’s one of few spots with reliable cell phone reception. I called my brother Bob to catch up on recent news. I made it back to my campsite at 4:30 just in time to join four fellow volunteers for a drive to our favorite eating spot, the Mobil station in Lee Vining. Cassie drove. Her parents and sister met us at the Mobil when we arrived. All of us shared an outdoor table. We continued eating through a brief shower. Neither food nor diners were the worse for wear. 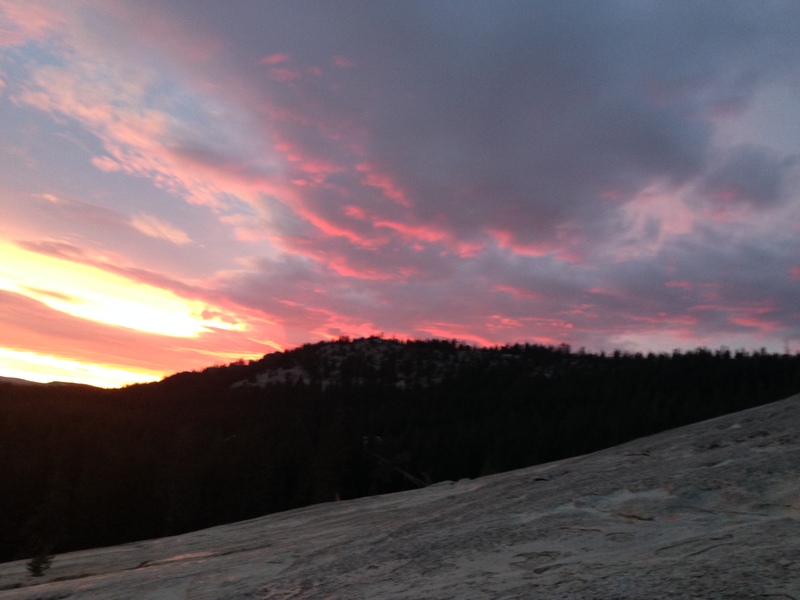 On the return drive to Tuolumne Meadows, one volunteer suggested stopping at Lembert Dome for sunset photos. The cloud formations and setting sun made for spectacular photos. This proved to be the highlight of a very good day. The showers have knocked down some of the pine pollen and lowered the temperatures. I expect a cooler night, more seasonable, with lows in the 30’s. Time to bundle up! In my prior outing at Olmsted Point where Yosemite Conservancy maintains a telescope so visitors can observe the Half Dome hikers who make the last 200 yards of their ascent on a pair of steel cables, I did not wear my Lawrence of Arabia headgear. The result was sunburn of my ears to the point they felt like Crispy Critters. I did not repeat the mistake today. 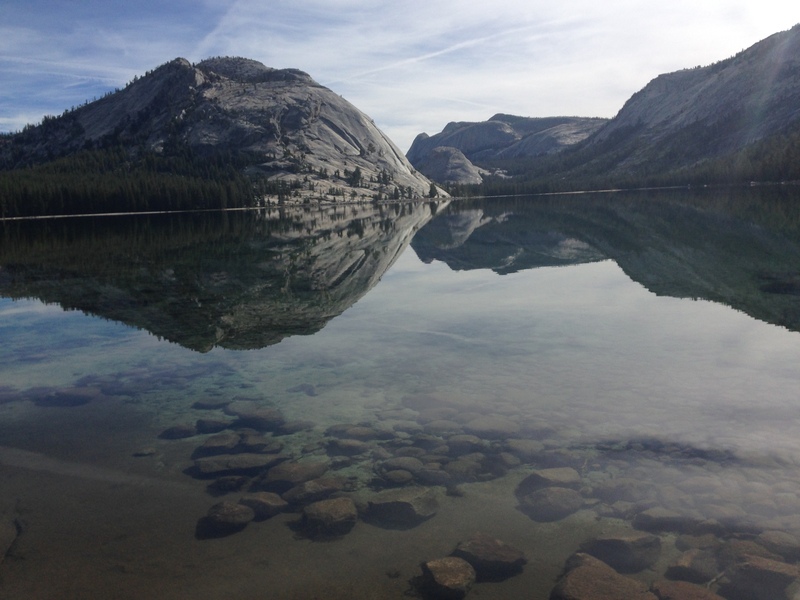 As has become my routine, I ate my breakfast at the west end of Tenaya Lake. Waterfalls are wonderful, but no scenery beats this pristine alpine lake set among massive granite domes and mountainsides. It’s my favorite way to start a summer’s day, particularly when the bugs aren’t biting. On to Olmsted Point. I enjoyed lots of interaction today. 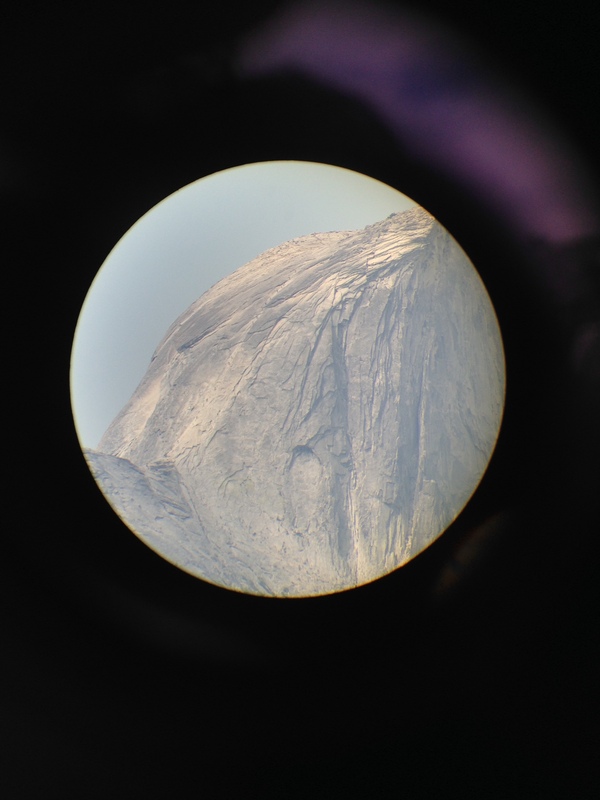 Most visitors burst out laughing when, looking through the telescope, they identify the tiny stick-like figures making their way up the steel cables of Half Dome. Some have made the hike recently or many years before. Others shake their heads, incredulous that people would put their physical safety at risk just to say they had reached the top. 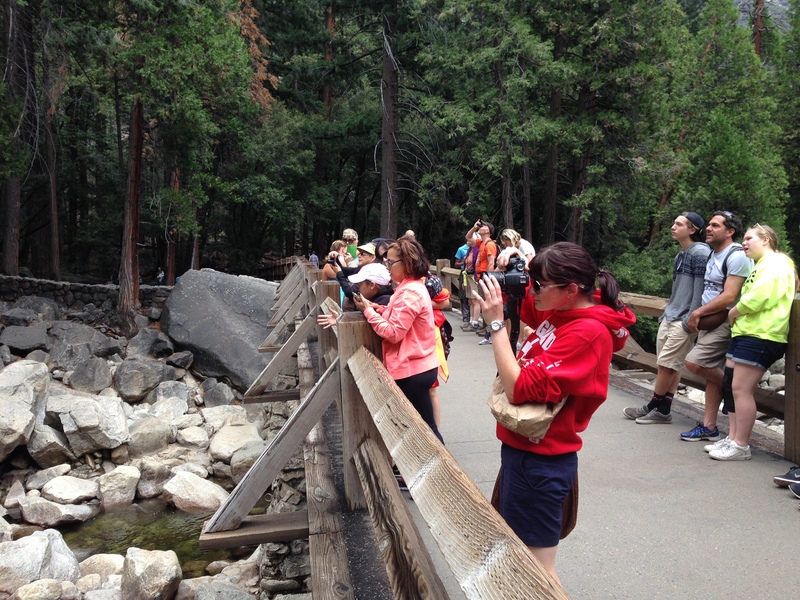 Visitors who had just come to the High Sierra from Yosemite Valley are amazed at the cooler temperatures. The thermostat had hit 105 degrees in the valley just the other day, while highs have remained in the mid-70s in the High Sierra. 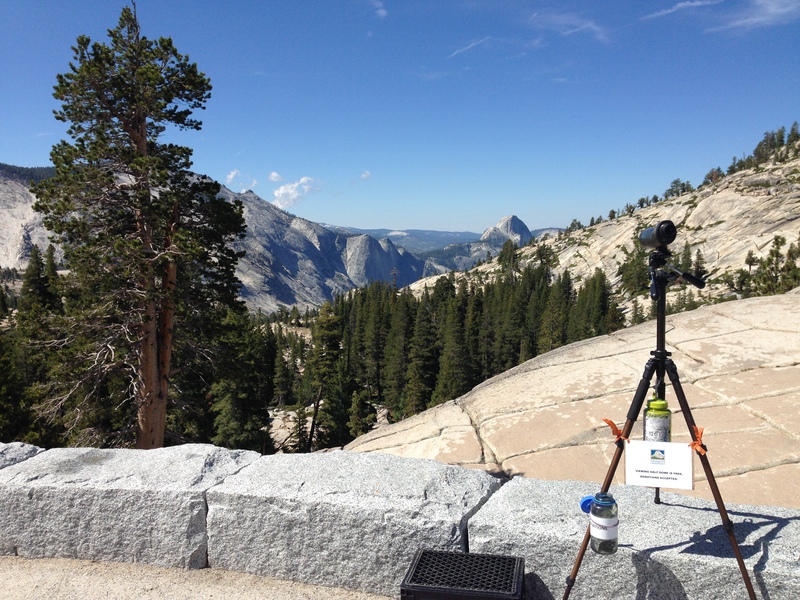 Along with the lower temperatures come light breezes in Tuolumne Meadows and occasional gusts at Olmsted Point. I remained at Olmsted a half hour beyond my normal shift. I then went to the Visitors Center to turn in visitors’ donations. After a quick lunch I headed to the Park Rangers’ laundry facility on Bug Camp Road. That chore affords me the opportunity to scribble these notes and call home. Ah, the rewards of keeping up with my domestic chores!